An hour before the party, I took the cheeses out of the fridge and brought them to room temperature. This is something you should always do when eating cheese, especially for a tasting. Delice de Bourgogne Triple Creme with the G Joy Genshu was the biggest hit. The sweetness in both the sake and cheese harmonized splendidly. Delice de Bourgogne also worked quite well with the Murai Family Nigori Genshu. Bianchina Pura Capra with the Gekkeikan "Black & Gold" was another favorite. L'Amuse Signature Gouda was the most consistent performer; it wasn't a hit across the room, but had a few fans for all sake pairings. Murai Nigori also did alright with the Bianchina Pura Capra and the Stilton. Maple Smoked Gouda was the least successful "partner" cheese. The biggest criticism was that it didn't taste smoky enough and was often overpowered by the sakes. Paired with the Murai Nigori was a total mismatch. Stilton with G Joy Genshu was also a pretty big mismatch. It was a really fun evening and I loved the fact that I was able to enjoy myself (I didn't have to tire myself out with any cooking!). I'll definitely host more of these kinds of events in the future, so stay tuned! 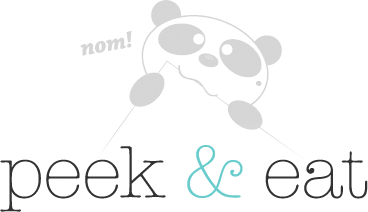 If you'd like to be added to the Peek & Eat Tasting email list, just comment, send me an email or message on Twitter.